If you are looking for a place to chill out over some drinks or even desserts, our Munchy Monday for today will definitely suit you then! Featuring Collective Brewers – situated on Changi Road and close to Kembangan MRT Station, this is a cafe that serves freshly grounded and brewed coffee as well as teas! Conversely, off River Valley Road on Mohd Sultan Road, lies Ippin Japanese Food and Sake, a airy and bright eatery + shop that serves fragrant Japanese teas as well as great sake. Collective Brewers is a nine-month-old outfit located between Kembangan and Eunos MRT stations, the heart of one of the most popular café districts in Singapore. Yet this is a café that distinguishes itself by its unique, playful dishes, its locally sourced roasted coffees, and its exquisite teas. It remains, despite the high quality of its food and beverages, an unpretentious, familial space, conceived by its founders as a meeting place for members of the community to kick back and have a good time. One of the signature dishes of Collective Brewers, the rendang grilled cheese turns a local favourite on its head by combining it harmoniously with an American classic. Stuffed between well-buttered golden-crusted slices of toast is a generous serving of perfectly seasoned slow-cooked beef. What ties these seemingly disparate ingredients together is melted provolone and cheddar, cheeses that cut through the richness of the toast and the spiced stewed meat. This dish, with strong flavours that will never fail to excite the palate, is served with sides of crispy French fries and a salad with an Asian vinaigrette. This stack of ondeh ondeh pancakes deconstructs another local favourite and reconstitutes it in a humorous yet extremely palatable way. The lightly savoury pandan buttermilk pancakes provide a counterpoint to the sweet mixture of shredded coconut and melted palm sugar that was generously lathered onto each layer of the stack. The vanilla ice cream garnished with toasted coconut shavings cuts through the otherwise cloying sweetness of the palm sugar spread and made a wonderful addition to the dish. While texturally different from ondeh ondeh, the familiar flavours that underlie the playful veneer of this dish will undoubtedly evoke a sense of nostalgia in many a Singaporean. This thick brioche encased in Milo powder is another homage to a popular local beverage. Despite its thickness the brioche was fluffy and supple, and the Milo egg wash was, surprisingly, not sickeningly sweet at all. The lightly bitter butterscotch syrup that was served on the side tempered the sweetness of the Milo. The fresh strawberries also provided a textural counterpoint to the spongy toast, and brought balance to a dish replete with flavours with which many would have become acquainted in their childhood. With a woeful dearth of decent teas in Singaporean cafés, Collective Brewers definitely stands out for being one of the few with a well-curated selection of teas, handpicked from established producers in China and Taiwan. This oolong tea from the mountainous region of Alishan in Central Taiwan had a lightly toasted aroma. This whole leaf variety was steeped in distilled water at a perfect temperature well below boiling point, which brought out the smooth, lightly savoury notes of the tea. Another great choice is the unique cold-brewed snow chrysanthemum tea ($7). This refreshing tea was slightly sweet with smoky and spiced flavours. With three steeps possible per serving, the teas at Collective Brewers are a perfect way of closing a heavy meal and is, for me, one of the most impressive aspects of this café. For the Iced Mocha, made with Collective Brewers’ cold brew concentrate from Brazilian beans prepared at a local roaster, the iced white was refreshing and worked well with the rich house-made pure Valrhona chocolate sauce that balanced the slightly acidic flavours of the coffee. It was mixed with milk and shaken over ice. 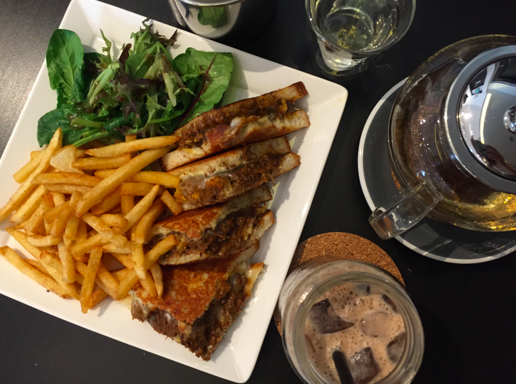 Other great choices at this café include the clean, classic long black ($4), and the cold drip ($5). The latter was served in a small, dense, chilled glass that kept the coffee at a perfect temperature. Its unique character worked well after rich foods such as the Milo French Toast. What makes coffees at Collective Brewers enticing is the fact that their beans are always changing, intended to feature different blends from various local roasters. All cold brew drinks are currently featuring Brazilian beans. This communal space has certainly lived up to its aim of being a welcoming and familial environment. It was airy and warmly lit, with sofas by the side and a communal table in the centre to create a convivial atmosphere. Outdoor seating is available too, allowing patrons to opt for a more casual aesthetic. While prices may seem slightly steep at first glance, they are commensurate to the consistently high quality of the food and beverages. Since many of Collective Brewers’ unique dishes were conceived in this café, and since the teas are unlike anything you would find in a similarly priced café, the prices are definitely reasonable. Located on Mohd Sultan Road and at the far corner sits Ippin Cafe Bar – a cafe + shop serving Japanese food, sake and tea. With it’s white-washed interiors and earthy tones, the cafe exudes a mori girl (forest girl) vibe that is as homely as it is simplistic. Started in October 2014 by Ayumi Fujishiro, this is also Singapore’s first home concept Japanese cafe bar and Ayumi herself is trained sake sommelier, so if you need help pairing sake with your food, you’ll be able to get some help on it. Most people may reel at the thought of starting a meal with alcohol on an empty stomach, but we assure you, this plum wine is mild enough for you to do so! On first sip, what you get is a unique smokiness in taste, reminiscent of whiskey but minus the harshness on the throat. This dry and smoky flavour will then slowly mellow out, leaving you with a tinge of sour and sweet aftertaste. Best drunk chilled, there is absolutely no need for you to dilute it down with ice as it’s not cloying sweet. In fact, it was a refreshing appetiser to start our meal with – a fairly interesting one too as we would have never thought of having a liquid appetiser! While we initially thought it was tuna and egg fillings together in a single sandwich, we were surprised to find that it was served as two distinct sandwiches instead! Served with a side of fries and a bowl of salad, while this may look like a simple enough dish that anyone can whip up in their own kitchen, do not be deceived by how it looks. Unlike the mushy egg mayo sandwich you get elsewhere, here, in-between 2 slices of wholemeal bread, egg and Japanese cucumber are diced to a good size, providing a mix of softness and crunch that gives the sandwich an overall well-balanced texture. To give it an additional kick, wasabi mayo was added to the spread, and while you can detect the distinct taste of the horseradish, the flavour wasn’t too pungent that it puts you off but instead works up an appetite for you to want more. While the egg sandwich was light in taste, the tuna sandwich however was slightly heavier in taste instead. Paired with a generous spread of yuzu miso, the sweetness of the spread further enhanced the umami flavours of the tuna, giving the filling a nice smooth texture that wasn’t too thick or creamy. It is pretty uncommon to find yakisoba being sold as a main here in Singapore – most place serve them as a side or ala carte dish of sorts instead. Many of these such places too, tend to dose their noodles with too much of the cloyingly sweet sauce as well as oil, and you can barely find any other ingredients such as cabbage or meat. Here at Ippin, what you get is a light but flavourful version of the yakisoba as close to what you can get in Japan, with generous servings of cabbage, onions, carrots and slices of meat, topped with finely chopped spring onions. There is a homely feeling that is exuded from this dish, perhaps due to the fact that the recipe originates from the owner, Ayumi’s father, who cooks this for her each time she returns home to Japan. For each set that you order at Ippin, you’ll be sure to be served with a bowl of mixed vegetables salad. The interesting thing here though, is that every salad comes without any form of dressing, and instead, you get to make your own dressing from a range of sauces and paste that they have available! Choose from their range of condiments available in the wooden tray, served to you by the friendly staff. For us, these 3 were our top picks – the red yuzu pepper, green yuzu pepper and ginger dressing. As pastes, the red yuzu pepper and green yuzu Pepper aren’t quite the ideal dressing for your salad, however, by mixing them with a little of the other sauces, the salty and spicy pastes give an alternative to the otherwise dull salad. Don’t get me wrong here – while salads generally are meant to be refreshing and light, it is nice to challenge your tastebuds once in awhile to not fit in with the norm too. The ginger dressing, which consists of bonito and shallot oil, is an interesting option as well, because the fragrance is so unique, you are able to taste different levels of the dressing distinctly despite it being bottled as one single entity. Using yuzu from Ehime prefecture and strawberries from Aichi prefecture respectively, these 2 fruit sakes are suitable for those of you who may not enjoy the the taste of rice wine as the fruity taste dominates your tastebuds instead. A tangy blend, the yuzu sake was mellow, with a slight tartness and bitterness to it which we felt would be better served mixed with soda. We imagine this would be great to have at the end of a heavy meal (such as with deep fried foods) as a palate cleanser. , this would be great at the end of a heavy meal (such as with deep fried foods). The strawberry sake, on the other hand, was a slightly sweeter treat – smooth and fruity, it was similar to a dessert wine, but with fruit bits evident within. In comparison with the yuzu sake, this would be more of a ladies drink and is definitely more enjoyable on it’s own without any ice etc added. A unique texture similar to tofu, the unsweetened milk pudding is made from roasted green tea (Houjicha) and served in a shot glass. Between spoonfuls of the dessert, you will be able to bite into the tea leaves that is present in the pudding as well, which gives the otherwise plain looking dessert a texture and also a lovely ending to a good meal. The cafe is cleverly divided, featuring 3 dining areas, and with a corner that stocks some of the products that they serve in the cafe for sale. With an indoor and outdoor dining area as well as a bar counter, the cafe bar is a ideal location for a bite or two in the afternoons or early evenings along Mohd Sultan Road, despite the area’s popularity for its nightlife activities instead. The shelves are constantly stocked with products from Japan, and some of which are only available here at Ippin in Singapore! Using ingredients and products flown in from Japan, Ippin may seem slightly pricey, but what you get in terms of quality and taste of the food isn’t something easily found elsewhere. The sake and food are the selling point of the cafe bar, and hence, it is no wonder that most of these products easily fly off the shelves as patrons make their purchase after tasting it in the premise. Want to try out the mains from Collective Brewers for yourself? Take part in this simple giveaway then! We are giving away 5 sets of mains, courtesy of Collective Brewers! 2. Tell us: What mains would you like to have at Collective Brewers?